Single-cell analysis holds enormous potential to study how individual cells influence disease and respond to treatment, but the lack of cost-effective and user-friendly instrumentation remains challenging. As described in a study published today in Nature Communications, researchers at the New York Genome Center (NYGC) and New York University (NYU) have taken steps to facilitate broad access to single-cell sequencing by developing a 3D-printed, portable and low-cost microfluidic controller. To demonstrate the utility of the instrument in clinical environments, the researchers deployed the device to study synovial tissue from patients with rheumatoid arthritis (RA) at the Hospital for Special Surgery (HSS). In collaboration with researchers and clinicians at HSS, a world leader in rheumatology research and disease treatment, the group used the instrument to profile joint synovial tissue from RA patients. RA is an autoimmune disease that affects 1% of the population and is associated with painful swelling in the joints. The precise cause of RA is undetermined and muddled by the diversity of cells found in the swollen joints of patients. The portability of the controller permitted patient samples to be processed on-site and immediately after surgery, minimizing handling and transport to optimize sample quality. The researchers collected samples from five RA patients totaling 20,387 cells and looked at the individual gene expression patterns for each cell. “This dataset gave us the opportunity to identify individual subpopulations of cells that could drive the progression of RA, even if they have not been previously characterized,” said Rahul Satija PhD, a Core Faculty Member at NYGC, Assistant Professor of Biology at NYU, and senior author on the study. By analyzing the complete dataset and searching for clusters of similar cells, the researchers identified 13 groups, representing both infiltrating immune and inflamed stromal populations. Of particular interest were distinct groups of fibroblasts with strikingly different gene expression patterns. “Roughly an hour after surgical excision, individual cells from patient tissues were labeled for single-cell sequencing. From this work, we have classified unrecognized fibroblast subtypes that may prove to be important drug targets for our RA patients,” said Laura Donlin, Co-Director of the HSS Precision Medicine Lab and Assistant Professor at Weill Cornell Medicine, and a lead author on the study. The researchers were able to validate the presence of these multiple groups using flow cytometry, and discovered that they exhibited distinct localization patterns with the joint tissue as well. The dataset is a step towards creating a comprehensive “cell atlas” for synovial tissue from RA patients. Moving forward, the researchers are compiling data from additional RA patients, and aim to obtain patient samples from other arthritic conditions such as psoriatic arthritis and osteoarthritis. In addition, they plan to use CITE-seq, a technique also developed in the Technology Innovation Lab at the NYGC, to more precisely classify cell types by measuring the presence of surface proteins in addition to the transcriptome. They also envision that technology will be useful for profiling samples that are difficult to study in a standard lab, such as highly infectious samples in biocontainment facilities or samples being collected in field research settings. 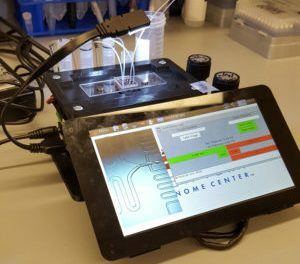 To facilitate its widespread use in the scientific and medical community, the instrument has been fully “open-sourced.” Instructions and assembly manuals for the instrument can be found online at the popular microfluidics repository Metafluidics (https://metafluidics.org/devices/minidrops). “We hope that this instrument lowers the hurdles associated with performing single-cell transcriptome profiling experiments in basic research and clinical settings,” Dr. Stephenson said. The New York Genome Center (NYGC) is an independent, nonprofit academic research institution at the forefront of transforming biomedical research and clinical care. Founded as a collaborative venture by the region’s premier academic, medical and industry leaders, the New York Genome Center’s goal is to translate genomic research into new diagnostics, therapeutics and treatments for human disease. NYGC member organizations and partners are united in this unprecedented collaboration of technology, science and medicine, designed to harness the power of innovation and discoveries to advance genomic services. Their shared objective is the acceleration of medical genomics and precision medicine to benefit patients around the world. Member institutions include: Albert Einstein College of Medicine, American Museum of Natural History, Cold Spring Harbor Laboratory, Columbia University, Hospital for Special Surgery, The Jackson Laboratory, Memorial Sloan Kettering Cancer Center, Icahn School of Medicine at Mount Sinai, New York-Presbyterian Hospital, The New York Stem Cell Foundation, New York University, Northwell Health, Princeton University, The Rockefeller University, Roswell Park Cancer Institute, Stony Brook University, Weill Cornell Medicine and IBM. For more information on the NYGC, please visit http://www.nygenome.org.